While there’s nothing better than spending a relaxing day snuggled up with your pup, even the biggest couch potato dogs need to regular exercise. Like humans, exercise is a must to help your pet maintain a healthy weight. Physical activity is also important for your furry friend’s joints and his overall health and well being. When a dog is stagnant for a long period of time, a number of problems can arise. His joints can atrophy and he can start packing on pounds (worsening joint issues), and his cardiovascular health will eventually decline. On top of all that, inactivity can also affect a dog’s mental health. What’s the best way to avoid these issues and ensure your puppy pal is as healthy and happy as possible? – By making sure that he remains physically active! A simple walk around outside can do a world of good for your pooch. But what happens when the weather isn’t conducive to heading outside? – A dog treadmill! Dog treadmills work much like treadmills for humans; except, of course, they are designed for canines. They’re pretty handy devices and can provide tons of benefits for your pet. But with so many dog treadmills on the market, picking the best option can be a bit challenging. With the help of a panel of experts, including veterinarians and dog trainers, we’ve carefully tested out several models. We’ve also read through countless dog treadmill reviews. Our research has lead us choose what we consider to be the best dog treadmills on the market. Why Does Your Pet Need a Dog Treadmill? Now that you’ve had a glimpse at our top five choices for the best dog treadmills for sale, let’s take a closer look at each one. Below, we offer a more in-depth description of each model. These reviews highlight the features of each model, what we like about them, and what pet owners who have used them have to say. Once you’ve read the reviews and chosen the best treadmill for dogs for your specific needs, click on the yellow button to find affordable prices on Amazon. We start our list of the best treadmills for dogs with the LF 3.1 Dog Pacer Treadmill. What drew us to it this treadmill was the high quality features, the durable construction, and the budget-friendly price tag. In fact, our panel of experts says that it’s one of the highest quality, yet cost-effective treadmills for dogs on the market! The dogPACER LF 3.1 Dog Treadmill can be used by dogs that weigh up to 180 pounds. 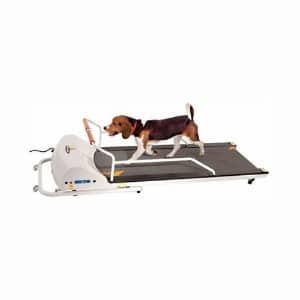 So, whether you have a Poodle, a Golden Retriever, a Labrador Retriever, a Corgi, or an English Bulldog, your furry friend will be able to use this treadmill with ease. With a running surface of 71 inches by 16.5 inches, your pooch will have plenty of space to move; he definitely won’t feel like he’s constricted. It’s powered by a 1.5 horsepower, whisper quiet motor. The motors on other treadmills that we tested were quite loud, which can be frightening to dogs and prevent them from using it. With this treadmill, you can either have your pup workout to one of the exercise activities that it’s preset with, or you can customize your own workout to suit the unique needs of your canine companion. Another feature that really makes this dog treadmill so attractive is its foldable design. It quickly and easily folds down and it’s lightweight, so you can easily store it away. And the compact size is a great option for tight spaces, or if you simply prefer not having an overly large treadmill taking up tons of space in your home. Final Verdict: For a space-saving, easy to store, affordable treadmill that can be used by most dogs, the dogPACER LF 3.1 Dog Pacer Treadmill is an excellent choice. We were really liked that it offers pre-set workouts, and that you can customize your own workouts, too. As for some users complaints about it being damaged upon receipt, these users said that they contact the manufacturer and received replacement parts with no problem. 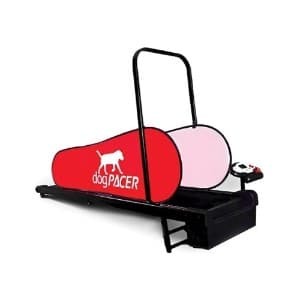 Next up on our list of the best treadmills for dogs is the Minipacer Treadmill, also from dogPacer. It’s virtually the same as the previous dogPACER treadmill on our list, just smaller. It’s lightweight and foldable for easy storage, but it offers a smaller running surface, which measures 38 inches long and 16 inches wide. It’s made for small to medium sized dogs that weigh up to 55 pounds, ideal for breeds like West Highland White Terriers and Cocker Spaniels. Made of carbon steel, this treadmill is extremely durable. The speed settings can be adjusted from .5 miles per hour up to 7.5 miles per hour in 1 mph increments. Or, if you prefer, you can use one of the fitness program that it is preset with. 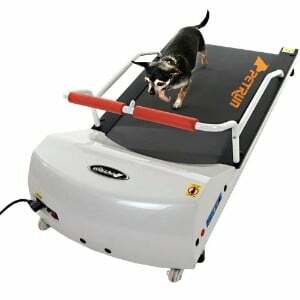 Like the previous dogPACER treadmill, the motor on this dog treadmill is also very quiet, so it won’t spook your pup. Final Verdict: the Minipacer Treadmill from dogPACER is a great choice for small and medium canines. It’s lightweight and foldable for easy storage, and you can customize the settings for your dog’s unique workout needs. While some users did say that they found it was too loud, it’s important to note that all dog treadmills do make noise; non are completely silent. With that said, we found that it was much quieter than other dog treadmills we tested. The GoPET Petrun Pr700 Dog Treadmill is a bit pricier than the two dogPACER treadmills that are listed above; however, given the fact that it comes with some unique features, we think that it’s fairly priced. There are three standout features on this dog treadmill. The first one is a remote control, which allows you to control it from anywhere in the room. If it seems like your dog is going too fast or is getting tired, you can slow it down with the push of a button. Likewise, if it seems like your pup is getting bored or needs more of a challenge, you can increase the speed with the remote. The second standout feature is an emergency stop, which increases the safety. You can access the emergency stop via the remote or by pushing a button on the side of the treadmill. Lastly, this treadmill offers a feature that prevents accidental operation, so you don’t have to worry about it starting up when your dog – or someone else – steps on it and doesn’t want to exercise. Made for dogs that weigh 44 pounds and under, this is one of the best treadmills for small dogs on the market. Final Verdict: If you’re looking for a treadmill for a smaller dog and storage isn’t a concern, than the Pr700 from GoPET is worth considering. It’s equipped with two great safety features, and it’s remote operated. However, do be advised that it is a bit louder than the two dogPACER treadmills we featured, but it’s definitely not obtrusive. Picture, if you will, a hamster wheel, but larger. Well, that’s pretty much what the GoPET Treadwheel is. Don’t let that image scare you, though; this treadmill is made specifically for dogs. It’s constructed of durable materials and is extremely stable, so it can easily withstand constant use. This treadmill can also be used indoors and outdoors, which is great if you want to give your pooch a change of scenery. The running surface is soft, yet supportive, so it will be comfortable under your dog’s feet and on his joints, too. And lastly, unlike other treadmills on this list, it’s not powered by electricity, but rather powered by your dog. That means that the speed automatically adjusts to your dog’s pace, so there’s no need to worry that he isn’t getting the best workout for him. Plus, he can use it when you’re not home because it doesn’t need to be plugged in or turned on! And, since it’s not electric, washing this treadmill is a breeze! – Just spray it down with a hose! This treadwheel can be used by dogs that weigh up to 150 pounds. Final Verdict: The Treadwheel from GoPEt is offers an innovative design that most dogs will love. There’s no need to worry about electricity, as it’s puppy-powered! But, do keep in mind that you might have to motivate your pooch to use it. If you find that your canine companion is a bit hesitant, try motivating him with a dog treat. Last up on our list of the best treadmills for dogs is another option that comes from GoPet, and it’s their basic Treadmill. This treadmills is made for dogs that weigh up to 130 pounds and is made of highly durably materials, which means that it’s extremely sturdy and can be used for a long time without having to worry about it being damaged. It’s also extremely stable and the running surface is flexible, yet sturdy, so your dog will enjoy complete comfort. The GoPet Treadmill offers adjustable speeds that can be controlled via the easy to operate buttons right on the device, or by a remote control. Users say that the remote control is very handy, as they don’t have to interrupt their dogs’ exercise session to adjust the settings. It also boasts dolly wheels, so you can easily move it. Powered by 1 horsepower motor, this treadmill gradually increases from a slow walk to a more brisk pace. The motor operates quietly, so there’s no need to worry about your pooch being spooked. Final Verdict: The construction and safety features of the GoPet Treadmill make it an outstanding piece of exercise machinery for a dog. It can safely accommodate up to 130 pounds, so this treadmill can be used by a large variety of dogs. We also like that the fur protection safety feature and the addition of an eyelet that a dog toy can be attached to. However, it is the most expensive dog treadmill on our list. Being a pet owner comes with a lot of responsibilities, and, you want to provide your pup with the very best of care. There are so many products on the market that are available for furry friends. Options include a dog crate, a dog bed, a dog house, an outdoor dog kennel, and a dog playpen. There are also tons of accessories to choose from, such as a dog seat belt, a GPS tracker for dogs, cooling pads for dogs, and even automatic fetch machines. And of course, there are all of the essentials, such as a dog bowl, a dog collar, a dog harness, and dry dog food or wet dog food. Depending on the unique nutritional needs of your pooch, you can also purchase specialized dog foods to meet his unique needs, such as dog food for sensitive stomachs, low protein dog food, and dog food for allergies. While you’re thinking about the care that your pup requires, there’s one thing that you definitely don’t want to forget, and that’s exercise. Like humans, canines require regular physical activity to maintain their overall health and well being. But what happens if you live in a location where taking your furry friend for regular walks isn’t possible? Or, what if your mobility is limited and you physically can’t provide your dog with exercise? For these types of situations, a treadmill for dogs will definitely come in handy. If you’re new to dog treadmills, you probably have some questions. In this section of our review, we offer some insight about this exercise equipment for dogs, including why your four-legged family member might need this type of exercise equipment, and the features that the best treadmills for dogs offer. Like a lot of pet owners, you might be thinking that a dog treadmill is something that your dog really doesn’t need. But before you make a snap decision and dismiss the idea completely, consider the following benefits that this type exercise equipment offers and you’ll likely change your mind. Great exercise. As we have mentioned, dogs need regular exercise. While walks are a great way to give your pup the physical activity he needs, it might not be a possibility for you. For example, if you work long hours, if your mobility is limited, or if you live in an area where the weather doesn’t allow for walks on a consistent basis, a treadmill is a great solution. 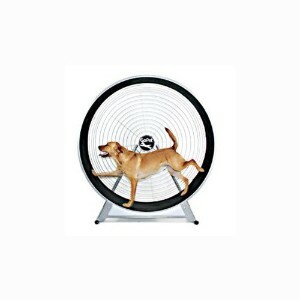 It will provide your pooch with the exercise that he needs on a daily basis. Improved physical health. With the regular exercise that a treadmill for dogs provides, your furry friend’s physical health will benefit in a number of ways. He’ll be able to maintain his weight, his muscles and joints will strengthen, and his cardiovascular health will improve. You want your dog to live a long and healthy life, and the regular exercise that a treadmill provides will certainly help to ensure he lives his best life. Improved mental health. Canines also need mental stimulation. Just like you, they need to be challenged and kept entertained. This is true for all dogs, including those that are highly active, and even those who do enjoy vegging out. With a treadmill, your pup can get the mental stimulation that he needs to keep him happy – and to keep him out of mischief, too! To up the stimulation, you can attach a dog toy to the treadmill, or perhaps set up a treat dispenser to offer treats whenever your pup finishes a workout. Dog’s weight. First and foremost, consider the weight of your dog. Different treadmills have different weight limits. Make sure that you purchase one that can accommodate your furry family member to ensure his safety. Safety features. You should also consider the safety features. Options include automatic stops, features that prevent fur from being caught, and even features that won’t allow the machine to start unless it’s properly enabled. Pre-set and programmable workouts. The best treadmills for dogs will offer pre-set workouts, as well as programmable workouts. With the pre-set options, just press a button and your dog can start working out. With a programmable workout, you can customize the speed and pace for your dog. Unless you want the treadmill to be set up in the same spot all the time, consider one that can be easily moved. Lightweight treadmills and those that feature moveable wheels will allow you to move the equipment with ease. There’s no doubt that you want your four-legged family member to live a long, healthy, and happy life. In order to achieve those goals, providing him with the best care with the best products is an absolute must. By offering him a dog treadmill, you can ensure that he gets the exercise he needs on a regular basis to ensure that he is healthy and happy – and lives a long life! Whether you invest in one of the treadmills for dogs that we’ve featured on our list or you decide to purchase another model, make certain that you choose a treadmill that will meet your pup’s – and your – unique needs.